Gas stations try to distract you at the pump. 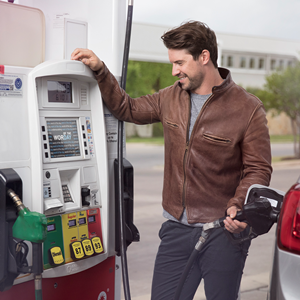 Self-serve gas stations have been around since 1964, and they’ve been a boon to the oil industry. Not only do they save money by not having to hire pump jockeys, but the general public took decades to master the pumps to the point where they could actually cut off the flow of gas at an even dollar amount. Once people were able to stop pumping at an exact $20, gas stations adjusted their pumps, giving the handles a pull-weight roughly equivalent to that of a New York City police department issued Glock 17. That may seem extreme, but it’s true. When people pump $20.02 instead of an even $20 by the millions it translates to millions of dollars in extra sales a year for the gas industry. The public must have begun to get more precise with their pumping though. So again the industry has devised a devious plan to distract us at the pump. Gas Station TV, or GSTV. This otherwise worthless feature now appearing at gas stations across the country is a desperate attempt to keep our attention off of the pump and gouge us for those extra pennies. It’s enough to make you seriously consider moving to New Jersey, the only state in the union that still outlaws the general public from operating a gasoline pump.